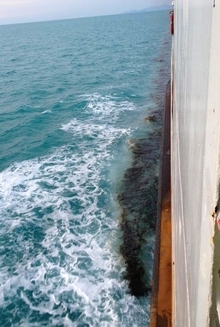 Russian tourist Ethaniel Pashae was shocked to see black liquid flowing out of the back of the Raja 2 Ferry she was travelling on, heading towards Don Sak on May 15. She took photographs of the liquid that looked like lubricant or oil and later, when she heard about an oil slick on Koh Samui, emailed the pictures to media outlets and contacted the authorities out of concern for the environment. 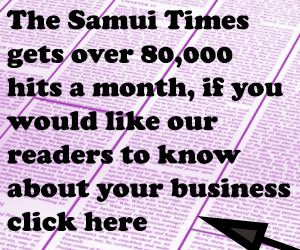 However, officials have ruled out any connection between the leak and the one kilometer long, fifty meter wide, oil slick that reached the coast of Samui on Wednesday. Director of the port at Koh Phangan, Pichet Sudduan examined the photographs and concluded that the liquid was released from the vessel somewhere between Tae Nok and Tae Nai islands that are located around ten kilometers from Koh Phangan, the vessels departure point. The location, and the time scale, indicated that the two incidents were not connected. 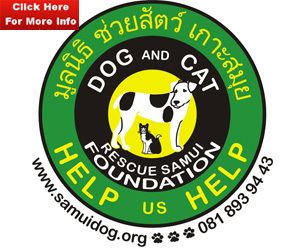 However, since the slick found off Samui has been identified as diesel oil and could have come from any number of boats in the gulf, Mr Pichet said he would issue a fresh warning to all boats to refrain from releasing oil and other harmful liquids into the sea and would demand clarification from the owners of the ferry as to what was released. Boonsiri Diewvanich, port director of the Raja Ferry said he had received a report from Raja 2 that he liquid was just cooling water from the tank in the engine room and not oil.